With a devotion to the highest quality of repairs, we use only the finest precision parts in servicing a broad range of equipment. From repairing drills and saws, to refurbishing batteries, we can help you to avoid the premature replacement of expensive power equipment. Cost-Effective All estimates are free and you’ll enjoy significant savings off the manufacturer’s repair prices. "No Hassle" Warranty The Surgical Equipment People offer a 'no hassle' full 6-Month warranty on every surgical power equipment repair. This warranty ensures our quality of workmanship, parts and materials. Quick Turnaround The average turnaround time for power equipment repair is 5 – 7 days. 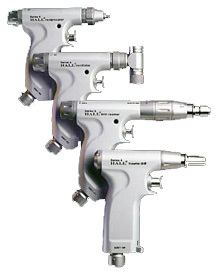 Free Loaners To eliminate down-time at your medical facility, The Surgical Equipment People offer an extensive inventory of commonly repaired loaner equipment at no charge (first-come/first-serve basis). Onsite Training The Surgical Equipment People will visit and educate your team about proper care and handling of power equipment. On-site Preventative Maintenance Program We will perform an on site 32-point condition assessment of your power equipment, document the results, and provide a comprehensive review of our findings. Additionally, we will offer recommendations to keep your power equipment in top working condition. This type of preventative maintenance helps to keep minor repairs from turning into major repairs. Peace of Mind To ensure that your equipment is safe from pick-up until it is back in your facility, The Surgical Equipment People carry complete liability insurance. Once the power equipment is received and checked in, our technicians begin the diagnosis and evaluation process. Our goal is to provide you with a comprehensive quotation for repair within 48 hours.